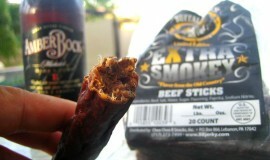 Meat snacks have been my favorite snack food for a long time, as evidenced by my Beef Jerky review blog. So as I’ve been writing that blog, beef jerky companies have sent me lots of free jerky to write about, and in addition, beef sticks. I never created a blog just for beef sticks, and didn’t really want to mix them into my beef jerky blog, so I’ve been writing about them here on Junk Food Blog. 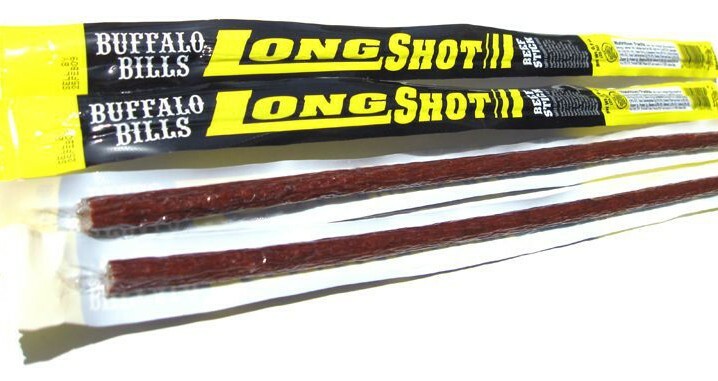 These “Long Shots” are from Buffalo Bills, a meat snack brand based out of Lebanon, PA. Beef sticks seem to take up the “dark side” of meat snacks compared to beef jerky, which the industry has managed to paint in a healthier light as being low fat, and low carb. But beef sticks are like sausage, where you love to eat them, but don’t want to know what goes in ’em. 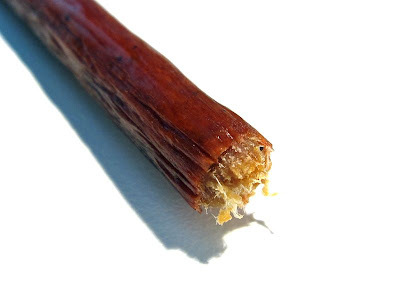 Part of the bad rap that beef sticks, in my opinion, comes from the God-awful Slim Jims. How that brand ever got to be #1 in the beef stick market is beyond me. Honestly, they’re like chewing wads of toilet paper, but with a meaty flavor. These “Long Shots” from Buffalo Bills are perhaps the closest thing they have to a Slim Jim in that they’re a the same thin and long shape, and they seem to have a similar “toilet paper” chewing texture, except I think Buffalo Bills has managed to shred the toilet paper into a finer pulp for easier chewing. Buffalo Bills offers several varieties of beef sticks, in fact I reviewed their “Extra Smokies” on this blog, and found those to be very good. Very meaty, very smoky, with some slight chocolatey notes, and chews very similarly to hard salami. If you’re looking for a good beef stick, try those. But if you’re someone who just really likes Slim Jims, then you might want to check out these Long Shots, I think they’re a tad better than Slim Jims.